The spectacular cliffs at Etretat culminate in a dramatic sea-arch with a needle of rock beyond. 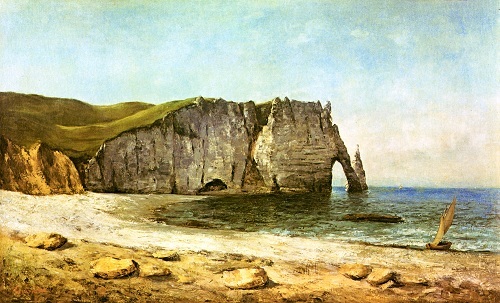 Courbet visited in the summer of 1869 and in a month completed five views of the cliffs and numerous seascapes. He worked quickly, painting out of doors. Here he uses a palette knife and a loaded brush for the rugged cliffs and contrasts this with the smoother texture of the grass and the hazy sky. 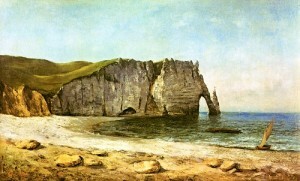 Etretat was a popular resort, but Courbet minimises any signs of humanity. Courbet’s landscapes were a commercially successful alternative to his Realist figure subjects which caused so much controversy.